WHEN: Thursday, April 6, 2017 from 6:30 – 7:30 p.m.
On Thursday, April 6, 2017 from 6:30-7:30 p.m. at Cathedral Square, there will be a Community Awareness Event in support of National Crime Victims’ Rights Week. The event is open to the public. A Vigil will be held in honor of crime victims. The program will include Mobile County District Attorney Ashley M. Rich, the Mobile County Police Department, and other guest speakers. Homicide families are encouraged to bring a picture of their loved one. Victim service providers and community agencies will also be available to discuss resources and services. 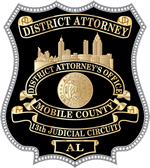 Some representatives include: LifeLines Counseling Services, the Drug Education Council, Penelope House, the Mobile County Sheriff’s Office, Alta Pointe, Legal Services, the Child Advocacy Center, and the Kids ID program with New York Life Insurance. The Mobile Azalea Trail Maids will also be present. The RSA Tower will be lit red, white and blue Thursday night in support of crime victims.